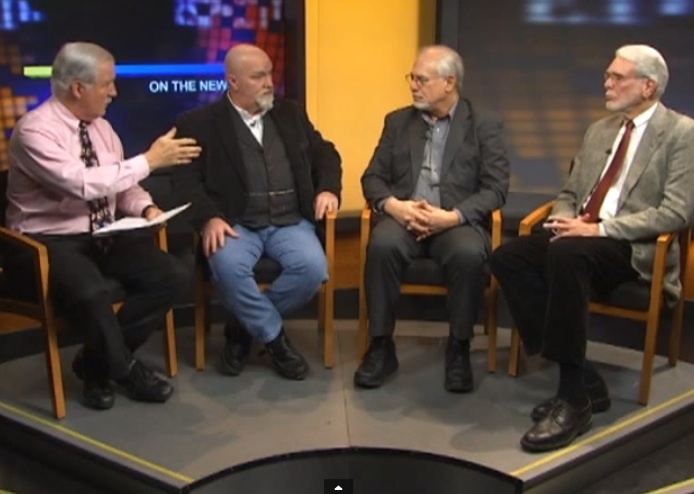 Appearing on the Dec. 21, 2014, broadcast of "Ethical Perspectives on the News" (left to right) are host Peter Welch, lobbyist and former congressional staffer Gary Grant, IowaWatch Executive Director-Editor Lyle Muller and professional mediator and former Iowa state Sen. Steve Sovern. The topic was political ads. The program is produced by the Inter-Religious Council of Linn County and aired on KCRG-TV9, Cedar Rapids. “Ethical Perspectives on the News,” a public affairs program produced by the Inter-Religious Council of Linn County for KCRG-TV9 in Cedar Rapids, Iowa, tackled the impact of political advertising in its Sunday, Dec. 21, 2014, show.